Westminster Public Art Project- Are You Artistic? Looking for a creative outlet? This Saturday could be just the chance you have been looking for to let your “inner artist” come out to play! The Members of the Paletteers Art Club are inviting members of the community to paint rocks! Yes, you heard right- paint rocks! The painting project will take place on Saturday, July 27th from 10 am to 4:00 pm at the Aar River Gallery at 3707 W 73rd Ave in Historic Westminster, Colorado. 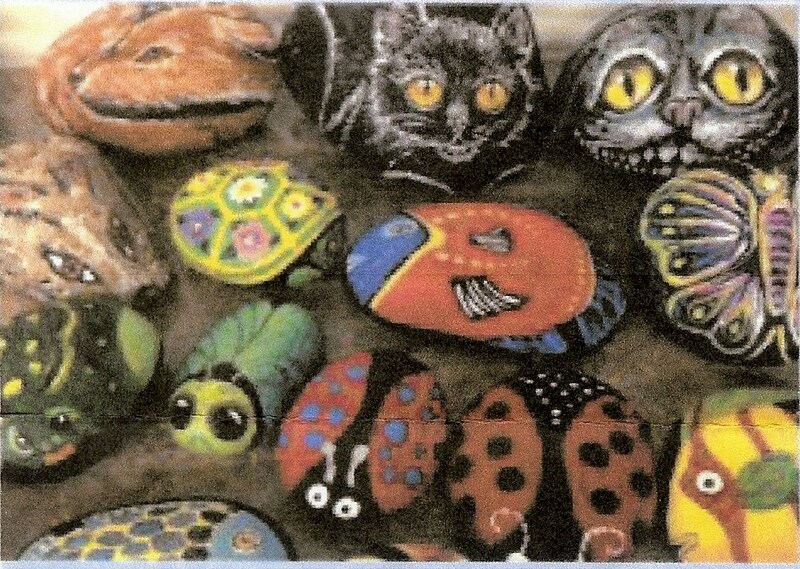 The painted rocks will be placed throughout Adams County in parks, trails, and landscaping around public buildings. Take a look at the photo above to see examples of the rock paintings! Now’s your chance to help make our county an even more beautiful place to live! And it is fun for “artists” of all ages. All supplies will be provided at the event- but you do have to give the rock to the Art Rocks Project (can’t take it home). Who knows- maybe your friends will be seeing one of your “masterpieces” the next time they take a walk in the park! Photo and Information Source: Art Rocks- A Public Art Project flyer. This entry was posted in Miscellaneous & Funs Things! and tagged 2012, decorations, ranch reserve, westminster on July 25, 2013 by joanbagwell. This is the November 2012 snapshot of the homes sales activity in The Ranch Reserve Neighborhood. The Status Categories are as follows: A= Active, A/B= Active, taking backup offers, S= Sold, W= Withdrawn from the market, X= Expired listing. Please feel free to contact me with any questions you may have about the real estate market or your home’s value. This entry was posted in For Sellers & Homeowners, Real Estate Market & Stats, The Ranch and tagged 2012, for sale, home, home values, house, market activity, ranch, ranch reserve, real estate market, real estate statistics, sale, westminster on December 12, 2012 by joanbagwell. Below, is the home sales activity for the month of November in The Ranch neighborhood. As you can see, compared to the hundreds of homes in the neighborhood, there is not a lot up for sale. I take this as a good sign, because low supply means a higher demand for homes, if a buyer were targeting The Ranch as the place they want to live. Higher demand, should also result in higher prices and shorter time on the market for sellers. Here are the definitions for the various “status” types: A=Active, A/B= Active, taking backup offers, Sold= Sold, W= Withdrawn from the market, X= Expired listing. Feel free to contact me with any questions you may have about the Real Estate market or your home’s value. This entry was posted in For Sellers & Homeowners, Real Estate Market & Stats, The Ranch and tagged 2012, denver real estate, for sale, home, home values, house, market activity, ranch, real estate, real estate market, real estate statistics, sale, sales stat, westminster on December 12, 2012 by joanbagwell. Prepared For: The Ranch, October Activity – Prepared By: Joan Bagwell – Nov 16, 2012. Information deemed reliable but not guaranteed. Properties may be listed by other real estate offices. Source: IRES mls. This entry was posted in For Sellers & Homeowners, Real Estate Market & Stats, The Ranch and tagged 2012, market activity, october, ranch, real estate on November 16, 2012 by joanbagwell.